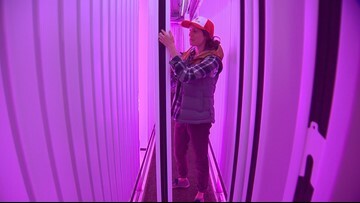 Metro Caring's new urban farming facility is in an old shipping container. 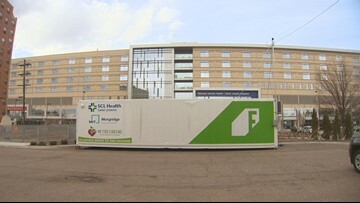 DENVER — A new container farm by Metro Caring, a Denver-based nonprofit, is housed in an unassuming white and green re-purposed shipping container in front of Saint Joseph Hospital in Denver. “We have our first crop planted,” Jess Harper cheerfully explained. The gardener and community activator for Metro Caring is standing inside the 40-foot-long, 8-foot-wide shipping container. Red and blue LED lights and state-of-the-art hydroponic technology make it feel like you step into another world upon entering the facility. Right now, Harper is figuring out the process of running the container farm. Metro Caring got it in December 2018 thanks in large part to a donation from the Morgridge Family Foundation. Saint Joseph Hospital donated the space and covers the water and electric costs. Metro Caring hopes to have the first harvest of butterhead lettuce ready in a couple of months. “We really can grow any kind of leafy green in here,” Harper explained. At capacity, the container can yield 500 to 600 plants every week. “The whole farm can hold about 2,000 plants at once,” Harper said. “It’s about the same as if you’re looking at a whole field of plants. It works like this: The hydroponic system uses water to transfer nutrients to the plants. Seedlings are planted in small groups. Being in the container allows the gardeners to carefully monitor everything from temperature to pH levels. Energy efficient LED lights replicate the nutrients the plants would normally get from the sun. They are on timers to get the plants the optimum levels of light each day. 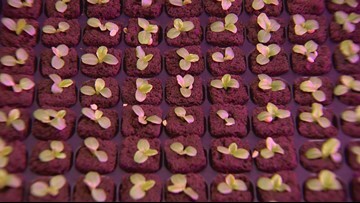 Once they grow big enough, the seedlings are transferred to growing towers. That drip system delivers the nutrients to the plants in the growing towers. More LED lights are strung about to give the plants the rest of the nutrients they need. The whole process uses only about ten gallons of water each day. There isn’t a set plan for where this food will end up just yet. “We’re really letting our community members dream about what we are going to do with this produce,” Harper said. The ideas include everything from being used in cooking classes, sold at farmers markets or given away at Metro Caring’s food bank. “The possibilities are totally endless it’s really exciting,” she said. Over the summer, Harper will work with several students from Manuel High School. They’ll learn not only the technical intricacies of farming in a shipping container, but why that food is valuable to the community it’s grown in.